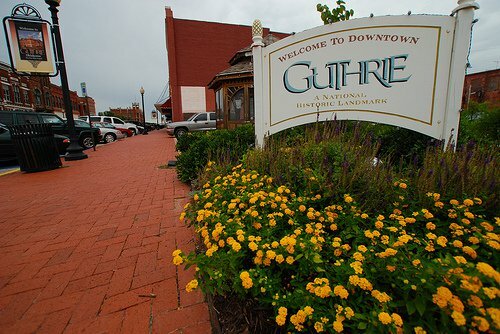 Guthrie's downtown district is a charming blend of Victorian-era architecture and modern touches that welcome guests to enjoy a variety of antique stores, boutique shopping and dining establishments. Of course, half the fun of antiquing is the thrill of undiscovered treasure buried in dust. Many antiquers find just as much enjoyment roaming store to store and checking out the variety of booths; whether carefully organized or a dizzying hodgepodge, each serves as a small exhibit, reflecting the curator’s individual style. Check out this list featuring some of Oklahoma’s antique meccas for your next day or three of treasure-questing. Situated right on the banks of the Arkansas River, Jenks, the self-professed “Antique Capital of Oklahoma” lives up to its reputation, offering boutiques that easily fill a weekend of shopping. Start off at Blue Heron Mercantile, one of the few shops statewide specializing in Early American (pre-1860) furniture. From Blue Heron, head north and get busy with some serious antiquing at the bevy of shops like Miss McGillicutty’s, Attic Treasures, American Heritage, Antique NV and River City Trading Post, headquartered right in the heart of downtown Jenks. Over the river and just east of Jenks, continue your antique quest with a visit to some of Tulsa’s hot spots. Check out the great selection of ceramics, glassware and clocks at The Antiquary Ltd., then spend a cold minute going through the massive showroom at Lou’s Antiques & Fine Furnishings. Finally, find that special something by perusing the vast number of vendors collected at Generations Antique Mall and local favorite, the I-44 Antique Mall. Settled in 1838 at a crossroads in Choctaw Territory, McAlester has a long and storied history. From territory days to the Civil War, Italian mining and the bustle of a railroad town, Old Town or North McAlester is filled with the past - and some great antiquing. Over a half dozen artifact purveyors, including Main Street Junction, Sanford & Sisters, Shelly’s, Rockn R, J.J. McAlester and Buffalo Gals Antiques all keep the past alive in Old Town McAlester. Whether carefully organized or a dizzying hodgepodge, each booth serves as a small exhibit, reflecting the curator’s individual style. Established in 1887, Ardmore began to prosper when the Santa Fe Railroad set up shop. In fact the abundance of cotton grown in the region turned the border town into the world’s largest inland cotton port. Eventually the soil tired and cotton fields ceded to the Healdton Oil Field, one of the largest oil prospects in Oklahoma history. Downtown Ardmore was built from both industries and not only features great early 20th century architecture, but quality antiquing. Antiques Etc., Cloverleaf Boutique, A Street Antiques, Ardmore Emporium and Parkway Antiques provide a haven for pickers and collectors alike. Much like Ardmore, Purcell was founded as a railroad town in 1887. With proximity to the Unassigned Lands, the small outpost rapidly grew when settlers moved in to the boom town before the Land Run of ‘89. Feel the past come alive while one-stop antiquing in carefully preserved downtown Purcell. Main Street features a pleasant mix of modern boutiques and antique shops like T’s Antique Mall, Grapevine, Butler’s and Auntie Mae’s Antiques. Metro Oklahoma City offers several great options for antique exploration. Stocked with 60 vendors, the 11,000 sq. ft. 23rd Street Antique Mall features antiques and collectibles ranging from colonial times to the 1950s. Kill two birds with one stone by stopping into neighboring North Western Avenue shops like Antique Avenue Market. Cruising west of the city, dig around at the 25,000 sq. ft. Britton Street Mall before heading toward Bethany for tons of antiquing in the renovated downtown district. Nested comfortably along the Mother Road, Bethany Antique Mall, Apple Tree Antique Gallery and Norma Jean’s Heirloom Jewelry & Antiques all promise a great day of picking. Enjoy the classic architecture and unique boutiques filling the downtown squares of county seats Guthrie and Perry. While the architecture is great, be sure to set aside some time for antiquing at shops like Recollections Antique Mall in the original Capitol City or the Downtown Antique District just up the road in Perry. Originally a trading post on the Chisholm Trail, Duncan was incorporated with the arrival of its first train in 1892. Oil exploration and developments (notably Erle P. Halliburton’s well cementing technique) led Duncanites to adopt the slogan “The Buckle of the Oil Belt.” This proud oil city offers a great selection of antique shops chronicling the region’s industrial history including Butterfields Antiques, 3 French Hens and Eclectic Echo & Co. While enjoying historic downtown Woodward, be sure to stop in to The Mercantile for a distinct antiquing experience. Offering a little bit of everything from vintage kitchen gadgets to knick-knacks, this 10,000 sq. ft. shop is sure to delight the savviest of collectors. Find even more hidden gems on our Antiquing page.